Every synth that has ever been made has at one time or another be forced to try and make a sound like that produced by some other synth. No matter what the synth, or what the manufacturers sonic intentions, somebody is always trying to get it to sound like a Minimoog! Usually the results are disappointing, but with very flexible synths such as the Nord Modular such expectations are very high. There are those that say emulating other synths on the Nord Modular is a fools errand, and people are better off getting the synth they really want, and use the Nord Modular for the unique sounds that only it can produce. Don't listen to them! Who can afford all of the synths whose sounds you want, anyway? In this chapter we provide a taste of the many and varied efforts that people have made to provide emulations of various popular (and some mythical) synths. You don't really have much control over control ranges (knob ranges, LFO and osc ranges) so don't worry about those, let the tuner find something that works and then who cares if it's accurate. As far as the filters, your choices are rather limited (ie do you want the D, E or F filter) and then since I almost never choose the F one, it's just a matter of picking whether you like the sound of the D or E one (and maybe if you need the features of the E one...) so you really can't get too far away from the nord character. Fortunately these filters are very good. I think the most important thing really is just getting the routings right, if the signal flows through all the right things and you have all the right modulations available, you're going to be about as close as you can get and you ought to have a usable and fun synth in any case. Mixers are easily the most useful module, since they can gather all the modulation sources and set their levels prior to modulating pitch or whatever. A few things that might not be totally obvious. For example, the Octave Cat is a 2 VCO synth with 1 LFO and 2 envelope generators (ADSR and AD). However, to emulate it, I had to build a 7 oscillator synth with 2 LFO's and 2 ADSRs, just so all the suitable signals were always present in the same way. But a synth like this is one heck of an instrument, especially if you break from some of the limitations of an accurate emulation (tune the oscs separately, add modulations etc). It is useful to use master and slave oscs, and you should note a couple things that might not be obvious. A master will propagate its pitch modulations to its slaves, but not its FM modulations, so you have to FM modulate the slaves the same way with similar signal routings as the master. Also, when a master osc is sync'd it doesn't sync the slaves, so you have to do that routing too, though not all slaves have a sync input. Some of the old monosynths would have made superior polysynths, which makes them fun to emulate. You can do "what-if" exercises, such as "what-if" my ARP Odyssey had a vocal tract filter. Finally, the one thing that you can't easily copy is the instability and signal overshoots of VCO's, it's helpful to remember that the nord oscs are perfect in shape and stability, so you might want to take steps to compensate, like mixing in noise, or modulating with a bit of noise or adding FM from an unpredictable source. AM can be useful here too. Wout Blommers has undertaken an extensive project to convert a vast library of DX7 sounds to the Nord Modular. In so doing, he wrote a nice description of FM synthesis and an explanation of how each of the DX7 "algorithms can be mapped to the Nord Modular. His writeups are available in the chapter DX7 to NordModular. The results of the conversion project, some 9400 different Yamaha DX7 patches, can be found at http://nordsynth.zevv.nl/010_NordModular/011_Patches/FM_for_Xmas/. Figure 15.1. A Yamaha DX7 patch converted to the Nord Modular (W. Blommers). 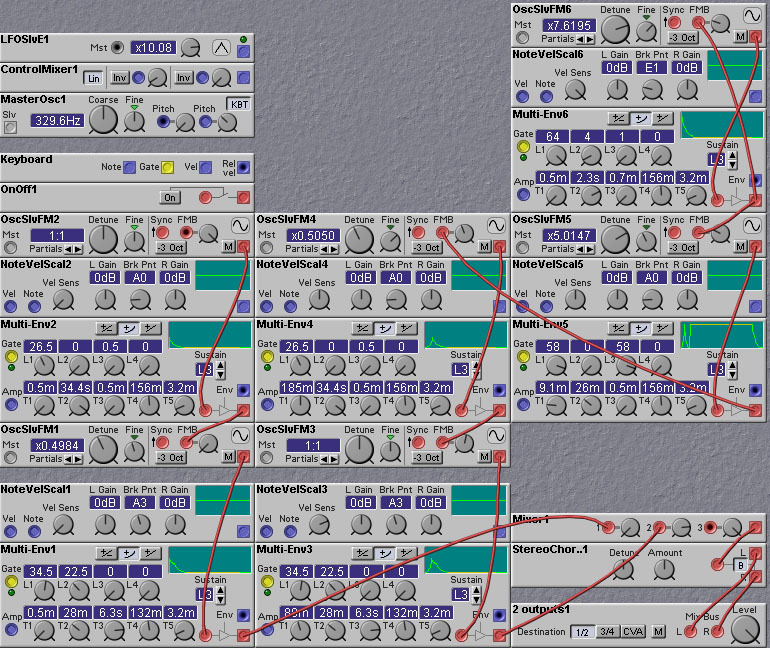 This patch mimics the architecture of the old Octave Cat analogue synth, my favorite monosynth. As much as possible, I also tried to duplicate the sound and feel of that synth. I named all the interesting modules in this synth. If there are no symbols preceding the name, either I am indifferent about editing the parameters in this module in the editor, or the values are important enough that I exported their control to an external controller. If I put a '+' symbol before the name, that indicates a module that has values that I want to encourage myself to tweak in the editor, like significant or interesting modulations or routings that I didn't export. In the case of the switches a '+' usually indicates that I intend to try different routings, but the mix levels in the switch may be specifically set and I generally won't mess with those. If a module name is preceded by a '! ', that indicates a structural element or logic setup that is carefully set (a necessary routing or a test) that I generally don't intend to mess with. In other words, these tweaking these modules is more likely to break the patch than to provide interesting modulations. I don't think I have any such discouraged modules in this Moctave Cat. In this document if I refer to the Cat I mean the Octave Cat, not the Moctave Cat. The ADSR amounts are controlled by the sliders on my QS8 keyboard (my master controller), which are set up as controllers 12, 13, 91, and 93 respectively. The Attack/Release (AR) sliders are not exported. They can be set in the "+AR" module, which looks suspiciously like an ADSR envelope. The Cat's "ADSR repeat" function is not exported. It can be set in the editor between off and gated in the "+ADSR repeat" module. The additional non-gated auto-repeat functionality of the Cat can be achieved by decoupling the envelopes' gates from the voice gate and holding it high. The Cat's sample and hold switch is not exported, but it can be set in the editor with the "+S&H source" module. It samples either VCO1 or noise, and is triggered by the LFO. The duties of the pitch slider are relegated to the pitch controller. The Cat's octave shift button is not implemented as I have a big keyboard. The Cat's glide (portamento) slider is not implemented in the Moctave Cat; it should be there but I haven't figured out the right way to do it yet. The LFO frequency is exported on knob 1. The Cat's LFO supplies a square wave (this is also used to trigger the ADSR repeat if enabled) and a triangle. In the Moctave, I substituted a sine wave for the triangle, since it gives a better sounding pulse width modulation and smoother vibrato and otherwise doesn't matter on my Cat patches. I think the original Cat designers would have used a sine wave here if they could have generated it inexpensively. Coarse tuning is on knob 4, fine tuning is not exported but can done in the editor by tuning the VCO1 master osc and the 3 slaves. The slaves are not phased accurately to the real Cat which means you can't really do that goofy Cat note-sequencing thing accurately, but I've always thought that that's more interesting than useful. As long as the phases are wrong, I slightly detuned the slaves because I like that sound better. The Cat's VCO1 keyboard control switch isn't fully implemented. If you bump the Moctave polyphony down to 1 voice, then the Moctave emulates the Cat's mono mode, and if you turn off keyboard tracking in the "VCO1 pulse" module, it's like turning this switch off. I don't thing the Nord can really emulate the Cat's weird poly mode, since that would require a bit of logic processing on the uncooked keyboard status and the Nord really only forwards processed keys. 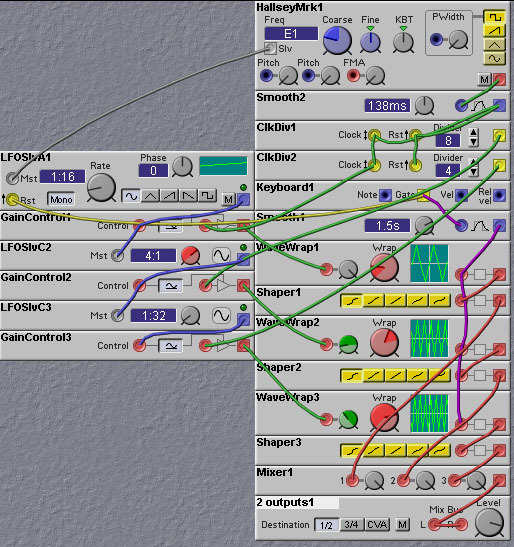 The VCO1 modulation routing switches are not exported, but they can be set in the editor. The first switch selects LFO sine (my default), LFO square, or sample&hold as the modulator and is labeled "+VCO1 mod1". The second switch selects ADSR, the AR envelope, or VCO2 (default) as the modulator, and this one is labeled "+VCO1 mod2". The Cat has a single knob to select the amount of modulation for each of the mod sources, and these knobs are in the "VCO1 modamt" module and exported as knobs 2 and 5. The VCO1 mod amount module also mixes in a bit of weather modulation since my VCO1 is not entirely stable. I did not have enough free modules to accurately model the effects of weather on my Cat though! The Cat allows you to either set the amount of VCO1 pulse width modulation or to dial in the width of the pulse. This functionality is not exported but is found on the "+PulseMod switch" module. Unlike most of my switches, I do need to set the knobs on this module corresponding to the selected switch. Finally, VCO1 supplies 4 waveforms: a suboctave square wave (1 octave down), a sawtooth, a triangle, and a pulse. You set the mix level for each of these waveforms on knobs 3, 6, 9, and 12. These mix levels determine both the sound of VCO1 and the degree of FM modulation of each VCO1 waveform on VCO2 if you have dialed in FM on VCO2. (That's knob 11 and the default selection of switch 3 on the "VCO2 mod2" module for those of you who have read ahead...) Similarly, the levels of the VCO2 waveforms will affect the amount and sound of FM in this VCO1 section if you left the default routing alone and dialed up knob 5. By the way, if the knob assignments aren't obvious (and I don't expect that they should be yet) there's a simple organization to them that I will explain near the end ofthis document. VCO2 coarse tuning is exported on knob 7. VCO1 can be synced to VCO2 with the switch in the "+Sync VCO1" module, though this doesn't really sound like the Cat's sync, and I haven't looked into why. On the Cat, you can get a nice percussive sound by using AR as the main envelope and using a quick ADSR envelope with 0 sustain to modulate the synced pitch of VCO1. I haven't tried this yet on the Moctave Cat, though. This section largely mirrors the VCO1 section, so "+VCO2 mod1" selects LFO sine, LFO square, or S&H as a VCO2 modulator, and "+VCO2 mod2" selects ADSR, AR, or VCO1 as a modulator, and the mod levels are set in "VCO2 modamt" and exported as knobs 8 and 11. VCO2 supplies 3 waveforms: suboctave square, square, and saw, and their mix levels are exported as knobs 10, 13, and 16. I use the Nord's filter D for the Cat filter, since this one is closest to my Cat's sound. By the way, my Cat is the original model with discreet components, later Cats like the SRM have completely different filters. The Nord's D filter is the one that comes closest to the Cat's high end sizzle, though its frequency range doesn't go nearly high enough; The Cat filter has a magical sound as it emerges from super-audible frequencies that no digital filter that I have heard can match. Also the D filter has the closest behaviour in that magical hi-Q zone near oscillation, but again a digital filter and midi controller really can't do justice to an analogue filter and a pot. Finally, at hi-Q, the D filter thins the bass frequencies the least and again, this behaviour is closer to the Cat sound than the other Nord filters. There is a bummer to filter D, though; Its modulator input is control rate rather than audio rate, which cruds up the filter if you attempt to FM it, and filter FM is yet another key to the Cat sound. I don't know what to do about this yet. Note that I left an E filter in there as well; If you dial that one in with the "+Filter picker" module you can get a decent Minimoog-like bass if you dial the other parameters in right. The Cat switch for VCO1 audio out is not exported but can be set by turning off knob 1 in the "+VCF Input Mix" module; this turns off its audio without disabling its FM abilities. Filter keyboard tracking is not exported but can be set in the "VCF" module. Like the VCOs, there are two switches in the filter section for mod routings, and they are not exported. "+Filter Mod1" selects between LFO sine(default), LFO square, and S&H to modulate the filter cutoff frequency, and "+Filter Mod2" selects between ADSR, AR, and VCO1 (default) to do the same. On the Cat, you can get some great nasty but still musically useful sounds by FM'ing the filter frequency. A good modification for the Cat would be to use an envelope to just FM the filter frequency on the attack. The filter modulation amounts are set in the "Filter Mods" module, exported as knobs 14 and 17. This module also includes a non-Cat mod routing: the third mixer sets the amount that ADSR modulates the cutoff frequency and this level is assigned to the main modulation controller (my mod wheel). This allows me to use both FM and ADSR on the filter, which I always wanted on the Cat. Finally, filter frequency and resonance (Q) are exported on knobs15 and 18. Still reading? Well we're almost done since the Cat is almost out of knobs, and the Nord is completely out of knobs... The switch for amplitude level is not exported, but it can be set in the "+AEnv choose" module. The selections are ADSR, AR, and bypass, and by default I use the ADSR envelope to determine the output amplitude. On the Cat, you often use AR as the amp envelope when you are using ADSR for effects like a filter sweep or transient pitch weirdness. Bypass mode makes for a great drone. And for the final knob, I don't export the Cat's noise control but you can set it with knob 3 in "+VCF Input Mix". A worthwhile modification to the Cat would be to route the noise through an envelope, but that's not how the Cat does it. There's a method to the knob organization that makes it reasonably easy to remember, especially if you're used to the real Cat. The first vertical block of 6 knobs is loosely dedicated to VCO1, the second block to VCO2, and the third block to the filter. The middle row is dedicated to modulators, so by default knobs 2 and 5 modulate VCO1 by the LFO and FM respectively, and knobs 8 and 11 do the same thing for VCO2, and knobs 14 and 17 do the same thing for the filter. The 4 knobs in the lower left select the output levels for the 4 VCO1 waveforms, and the upper right 3 knobs do the same thing for the 3 VCO2 waveforms. That leaves us with 3 knobs in the upper left which are LFO speed, VCO1 tuning and VCO2 tuning, and 2 knobs in the lower right which are filter cutoff and resonance, just where they are on the Cat. A lot of the Cat's nasty sound comes from all those rough edges in the waveforms. You can smooth the Cat a good deal by changing the suboscillators to sine waves. This will lose a bunch of high frequencies from the sound; it can sound very good but it won't sound like a Cat. Many of the weirder Cat sounds are had when you do bi-directional FM, where VCO1 modulates VCO2 and vice-versa. You can route a signal for FM into either an oscillators pitch input or its FM input. These inputs have very different ranges and somewhat different responses, so I let you pick whichever sound works better for you; pick the ones you like in each of the two "+FM type"modules. Figure 15.2. 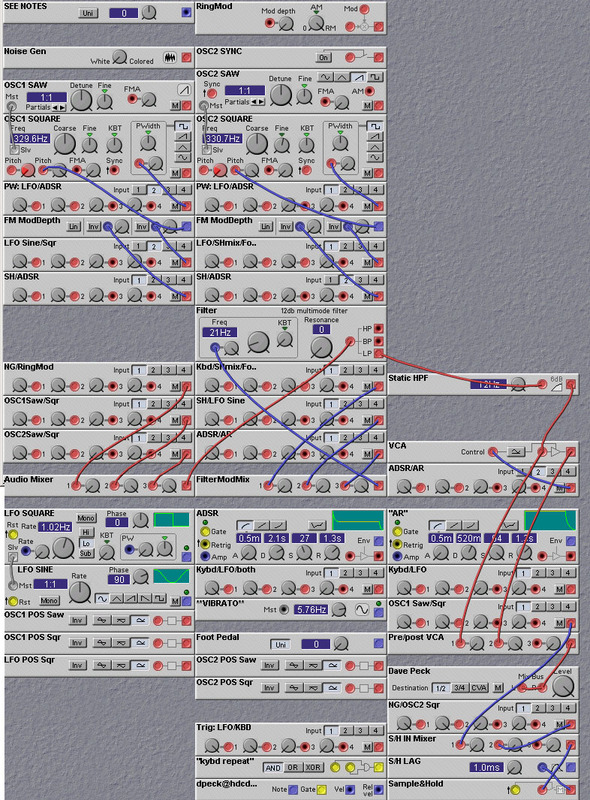 A Nord Modular emulation of the Octave Cat (S. Streeper). The first synth I ever bought was an Arp Odyssey, in 1973. Although the Minimoog was more popular, and although many feel the Mini had a better sounding filter, I felt the Odyssey's versatility more than made up for any sonic shortcomings. The Odyssey had pulse width modulation, oscillator hard sync, a ring modulator, and a versatile sample/hold section, none of which were included in the Minimoog. Also, the sample/hold section had a dedicated input mixer, and the output of this mixer could be used for audio-range modulation of the filter, also not possible on the Minimoog. I sold my original white Odyssey to finance the purchase of bigger synths, and then bought another early black face Odyssey several years later during a sudden attack of gear nostalgia. I've used it from time to time, but maintenance is an issue, as it is with all vintage analog synths. Thus, it seemed like a good idea to replicate the Odyssey in the Nord Modular. The Odyssey used an ingenious system of patch switches to quickly select a variety of patching configurations. This was a good compromise between versatility and speed, without the hassles of patch cords or the limitations of a completely hard-wired synth. My goal was to replicate the Odyssey as completely and accurately as possible, including the method used to set up a patch. This meant devising a basic patch architecture that included patch switches instead of requiring the user to draw patch cords. On the Virtual Odyssey, the patch switches are represented by the switches in the 4-to-1 switch modules, and the names for these modules show the available switch selections. For example, the module labeled "NG/RING MOD" selects between the noise generator and the ring modulator as the input to the first knob in the audio mixer. Thus, by simply selecting switch positions and turning virtual knobs, you can replicate any sound that was possible on the real Arp Odyssey, without drawing any patch cords. In fact, you can make sounds that were not possible on the real Odyssey, because some parameters on the NM have a greater range than the equivalent parameter in the real Odyssey. For example, the LFO can run slower and the envelope release times can be longer than the same parameters on the real Odyssey. There are some modules which are used to process the Nord's signals to more closely resemble the signals on the Odyssey. The waveforms in the Odyssey's audio oscillators and LFO were positive-going only, unlike the bipolar waveforms in the Nord Modular. Thus, a collection of Level Shifter/Inverter modules were used to alter the Nord's waveforms. Although an audio oscillator sounds the same whether it is bipolar or unipolar, it makes a difference when you use these waveforms as modulation sources. Since the Odyssey had more sliders than the Nord has knobs (I think the Odyssey has 32 sliders), I opted not to assign any parameters to the Nord's front panel. I'll leave it up to the user to assign them as needed when setting up a patch. The real Odyssey had one major feature that I was not able to replicate on the Nord. The Odyssey had a unique "duophonic" keyboard. When you pressed two keys, OSC1 played the low note and OSC2 played the high note. This was useful for producing distortion effects when using the ring modulator, among other things. Note that this is not the same as simply setting the Nord to have two voices. If you get ambitious, please feel free to try to figure out how to achieve the duophonic effect. One minor difference between the Nord and the Odyssey is the way the filter responds when resonance is set to maximum. On the Nord, you must send some amount of audio into the filter to trigger filter self-oscillation. This was not necessary on the real Odyssey. Figure 15.3. 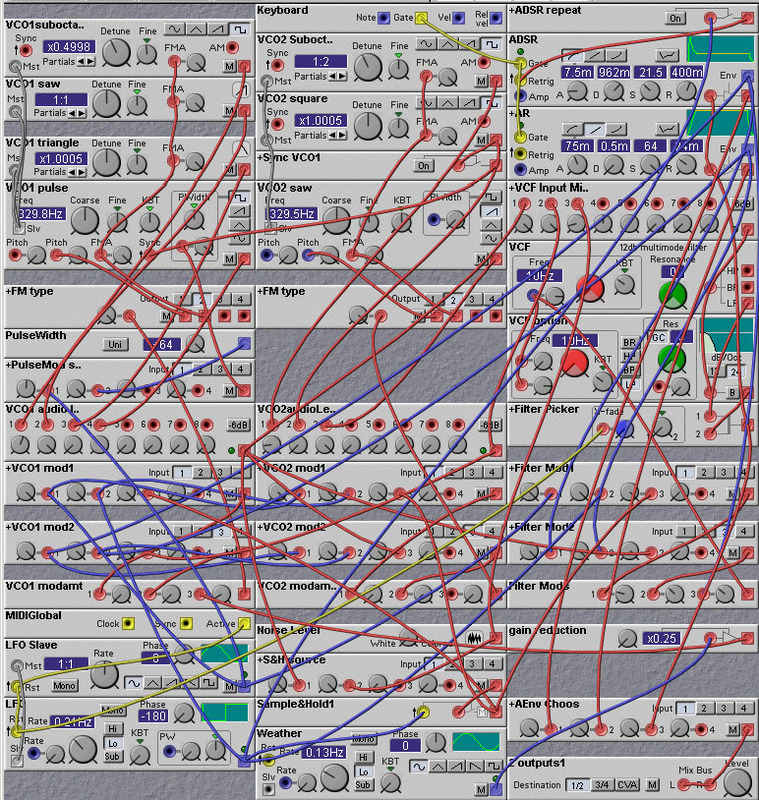 A Nord Modular emulation of the Arp Odyssey (D. Peck). Knobs in 4-to-1 switch modules should stay at MAX. Switches in 4-to-1 modules act as the patch switches across the bottom of the panel on the real Odyssey. Module names in the 4-to-1 modules indicate switch selections. Example - the switch module below the VCA is labeled "ADSR/AR". Button 1 selects ADSR, button 2 selects AR to control the VCA. GREEN cables - audio signals routed to patch switches (HIDE). PURPLE cables - control signals routed to patch switches (HIDE). RED cables - hardwired audio signals BLUE cables - hardwired control signals YELLOW cables - gate & trigger signals (HIDE). Just looked up Phase distortion in Curtis Roads's excellent computer music tutorial - and there is this bit on the subject: "Phase distortion synthesis is a term invented by the casio corporation to describe a simple modulation technique developed for several of its digital synthesizers. PD synthesis uses a sine wave table lookup oscillator in which the rate of scanning through the oscillator varies over the cycle. The scanning interval speeds from 0 to PI and then slows down from PI to 2PI. The overall frequency is constant, according to the pitch of the note, but the output wave form is no longer a sine....." I think Casio used two (digitally simple and DSP cheap) tablescan oscillators with both the same basic frequency and synced to each other. Then when adding a bit of the output to the tableindex of the other the phasedistortion occurs. This would mean a sineoscillator's output to an FMB input on a SlaveFM oscillator, setting both to the same frequency and syncing the SlaveFM to the sineoscillator. But I remember vaguely from the frontpanel of a CZ-100 (it was called that way, wasn't it? only knew one guy that had one of those Casio's in the eighties) that it could be done with other waveforms than a sine as well. Anyway, I like to do it as in the attached patch. Using the multiwave slave gives a more harsh sync-like sound, more like the CZ-100 as I remember. The sinevalue here is not added to the 'tableindex' as with the SlaveFM (FMB), but lineair to the frequencyvalue (FMA), so not proper I suppose. But what's proper anyway? Additionally the AM input on the slave oscillator is used as a ringmodulator, suppressing small glitches that occur at the beginning and end of a waveperiod on the NM's oscillators when using sync, due to waveform interpolation (beginning) and FMA modulation (end). Figure 15.4. A Nord Modular emulation of the Casio Phase-Distortion synthesis technique (R. Hordijk). The first try-out we did was during a gig and the sound was so terrible, the organization of the party threw us out! After that failure we build the Hallsey Mark 2. (The name Hallsey was chosen 'cause our bassman made MARSHALL on two plates, MARS did fell off the fake amplifier and we added 'sey') The Mark 2 was a real modular synth, only its oscillators wouldn't tune in line... (It had sample&hold, mixers, LFO's and all that stuff) The Mark 2 was stolen during a gig and some days later our leadsinger found the poor thing at the side of a road, 'cause the thieves couldn't make any sense out of it, me think. Mark 3, of course also from the famous 'Hallsey factory', was, so I believe, one of the first Synths which used AD and DA converters. Two of our gang worked at the university, where such electronic equipment was developed for Philips. (No, they didn't steal them: it was just an university, you know, where the professors also carry uranium 238 in their pockets) I think only the Mark 1 is interesting to emulate here ;-) Played in the lower regions, it was a wonderful beatbox, but we didn't knew then... (Press the low C and hold it a while) Those Shapers were really there. The LFO's in a way too. And the distortion remains! Figure 15.5. A Nord Modular emulation of the famous Hallsey Mark 1 (W. Blommers). Emulating favorite synthesizers seems to be a popular pastime with Nord Modular owners. Here is a list of some vintage synthesizer emulation patches. ARP 2600, by Roland Kuit (this is just a basic template - Roland has created many more patches using this template). ARP Omni, by Andy "Buckshot"